‘Maquettes maken’ is the Dutch edition of the English book ‘Architectural Modelmaking’ published by Laurence King. The book covers all stages of three-dimensional visual presentation, from simple cardboard sketch models to complex computer-milled examples. Following a brief introduction, the book is divided into three chapters on media, types and application, providing a concise yet broad ‘toolbox’ for students and practitioners. It includes valuable practical information on tools and techniques, the use of materials ranging from cardboard, wood, metal, concrete to plastic, and computer-generated models. 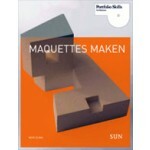 ‘Maquettes maken’ is a practical book with step by step instructions.